Savvy enthusiasts and even professional repair shops order their Land and Range Rover parts online from CPD, as our prices are often lower than their wholesale suppliers. Some Land Rover owners opt for used replacement parts, but these components are often just as worn out as the pieces being replaced and may fail at any time. And don't forget about the cost of installation, which is the same whether you're installing new or used equipment. Better to go with new, unused equipment from a reputable online supplier such as CPD. 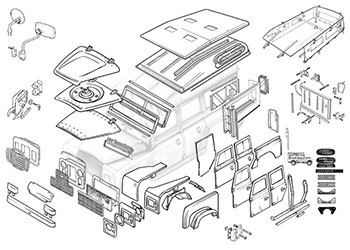 Enter the year and model of your vehicle to see all of the online Range Rover parts we have available, and find out how much you can save on the repair bits you need. Enamored with their trucks' aluminum alloy bodies and off-road prowess, passionate enthusiasts often refer to other brands of four wheel drive vehicles as "disposables" and devote a considerable amount of free time to off-road excursions and organized events. They also are meticulous when it comes to maintenance, using only the highest quality aftermarket or genuine Land Rover parts. But rather than pay inflated prices at the local Rover dealer, many owners search for replacement products online or from a comprehensive catalog. Genuine OEM components from online "mail order" shops are no different than those purchased from the dealer, and the shipping fees are usually insignificant compared to the typical savings. Headquartered in Gaydon, Warwickshire, England, Land Rover has enjoyed a reputation for rugged off-road ability since its founding in 1948 by Maurice Wilks, the head designer of British automaker Rover. Wilks wanted to create a lightweight vehicle using Land Rover parts that merged the best attributes of a farm tractor and a truck, and was inspired to build the vehicle after using an American WWII Willys Jeep on his farm for a summer. Original versions included a center mounted steering wheel (like a tractor), box-section ladder frame, "Birmabright" aluminum alloy body (steel was in short supply after the war), front and rear power take-off drives (for operating farm equipment), and were painted with green military surplus paint. Later generations or "Series" were slightly more refined and equipped with more powerful engines, and the company eventually added modern luxury SUV models to the line. The Range Rover variation made its debut in 1970, with creature comforts such as power steering, leather or cloth seats (instead of vinyl), carpeting, air conditioning, wood interior trim, coil spring suspension and disc brakes. Over the years the company has been owned by British Leyland, British Aerospace, BMW, Ford, and currently Tata Motors of India, and is the second-oldest surviving maker of four wheel drive vehicles, second only to Jeep. CarPartsDiscount.com is not associated with Tata Motors in any manner. All images and references to the Land Rover name, vehicle model names, logo and shapes are for reference and identification only. All trademarks, tradenames and/or service marks are the property of their respective holders.